Grand Rapids, although my favorite race up to this point is the Mother’s Day 8k Classic in Sydney, Australia. I enjoy traveling and learning about up-and-coming businesses. I want to eventually run Boston. I run to stay healthy and to have the opportunity to take advantage of being healthy. It really is an “opportunity” to be healthy … therefore I make the most it! Plus, I enjoy traveling and running races in so many different cities. In fall of 2011 I ran 3 marathons in one week. I did Chicago, Indianapolis, and Grand Rapids. The feeling after finishing the third one in Grand Rapids was awesome! 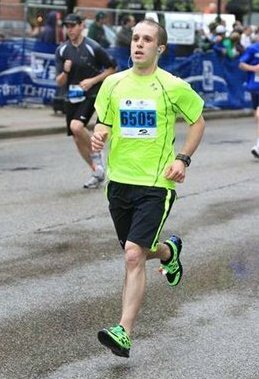 I pace because it feels good to know that I can help so many other people accomplish their personal goals. Whether those goals are to finish the race, have fun, or set a personal record … it’s a lot of fun to know that I can help get you there! Over the past couple of summers I have paced runners for Gazelle Sports in Kalamazoo. Two summers ago we went on a trail run and it started thunder storming (lightening and all) … We were all covered in mud (head-to-toe), and soaked from the rain. Honestly, this was probably one of my favorite runs of all time because we didn’t care about how far we were going … we just went running on the trail seeing mother nature in full force! Runners should join my pace group because I will make sure you are informed about the race, water stops, and everything else you need to know. I usually get to the start line early to help answer any questions you might have before the race as well. I’ll get you to the finish and we’ll have fun in the process! Don’t look down on the bridge! Just kidding … but have fun. Ask questions if you need to know something.